I am fascinated by the revolutionary social entrepreneurs who have used the Internet to build a capability that did not exist before. I am a long time supporter of Kiva.Org, which has changed the traditional model for micro lending by using the power of the Internet. Kiva defines itself as the world’s first person-to-person micro-lending website, empowering individuals to lend directly to unique entrepreneurs in the developing world. On Kiva.org, you can find profiles of 100s of qualified local entrepreneurs which you can browse through and choose an entrepreneur you wish to fund. You transfer the fund to Kiva through PayPal and Kiva aggregates this loan and transfers it to its micro lending partner and the entrepreneur. The borrower send updated information and messages to the lenders and when the loan is repaid, lenders can withdraw their principal or re-loan it to another entrepreneur of their choice. I am especially amazed by how fast this process is and how I have no bureaucratic jargon or heaps of paper work that I would probably have to experience had I had to do this in person. Kiva’s President Premal Shah, formerly from PayPal, realized that the biggest constraint to growth for the 3,300 + microfinance institutions around the world is getting access to capital from a bank. The best way for these institutions to expand their operations and hence reach more people is to give them access to more capital. This is where Kiva comes in. It simply connects the lenders to the borrowers and makes capital seamlessly available. It is an empowering concept for both the lenders and the borrowers. For as little as $25 dollars you can contribute to someone’s dairy farm, peanut butter factory or a beauty saloon in a developing country. I have to date loaned to 19 different individuals total and have had a 0% default. Kiva allows each of their lenders to create their own lender page which not only gives detailed information on what their lending portfolio looks like, but also gives statistics on what the average Kiva user looks like. 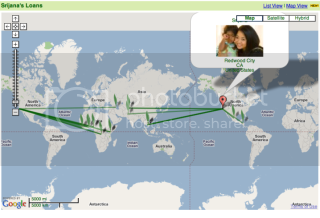 I am awed by this map that shows exactly what part of the world my loan has virtually traveled to. I like Kiva for its concept and for what it stands for. It is a non profit with a unique business model enabled by the web and was started by individuals who were once employed in high tech companies. It is founded by a Stanford student who was inspired by Mohammed Yunnus and is run by individuals who are very passionate and believe in what they do, and through contribution of hundreds of volunteers who are translators, researchers etc. It’s the Web 2.0 technology that Kiva utilizes which enables a very personal approach to microlending that is very appealing to people. It has that “emotional factor” so to speak. 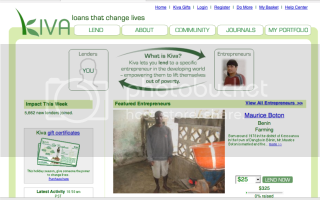 As of September 6, 2008, Kiva has $42,356,160 in loans from 333,737 lenders. That is 333,737 human connections made possible by the power of the Internet and growing! When I think of everything Kiva has achieved, I believe even strongly on the importance of bridging the digital divide and giving every individual in the world access to opportunities that did not quite exist before.